There are so many different ways to approach the professional greetings for your phone system. 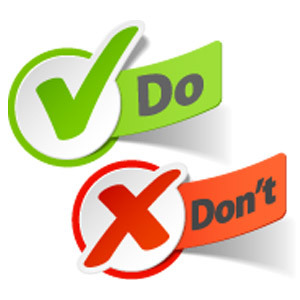 Here are our Do’s and Don’ts. Don’t write anything longer than two or three sentences. How long will it take to record my greetings? Our standard delivery is 3-5 business days. You may choose rush delivery for an additional charge. What happens if my Voice Talent is unavailable? You may choose to wait for them to become available again, or, select a new talent. How do I upload my greeting? Every service has their own unique ways to uploading greetings. Please consult your service provider to determine how to insert them into your phone system. Sorry! Please reply to the e-mail in which you received your completed order and we will gladly redo it for you. In order to keep our costs down, support is limited to live-chat and email. Please email [email protected] for the quickest response. Recordings are charged based on your word count. 250 words = one page and, one page = $99. A rush fee of $15 is applied for scripts that request a 24-hour turn-around. Why can't I choose a voice talent with rush delivery? In order to assure we can deliver your scripts within the rush delivery time frame, we cannot guarantee that every voice talent will be available. Can I use my greetings for my Twilio app? Absolutely. We deliver all recordings as you submit them. You can order phrases, words or greetings of any time to compliment your Twilio app. Why don't you have more Voice Talent? We have learnt over the years that too many choices actually make it more difficult for our clients. We have narrowed down our list to a select few Female and Male voice talent who do an amazing job at communicating your message. VoiceStudio Pro’s mission is to make professionally voiced messaging the standard for phone-based systems. Get a professional greeting for your phone system, voicemail, IVR or Cloud-based PBX starting at only $99.